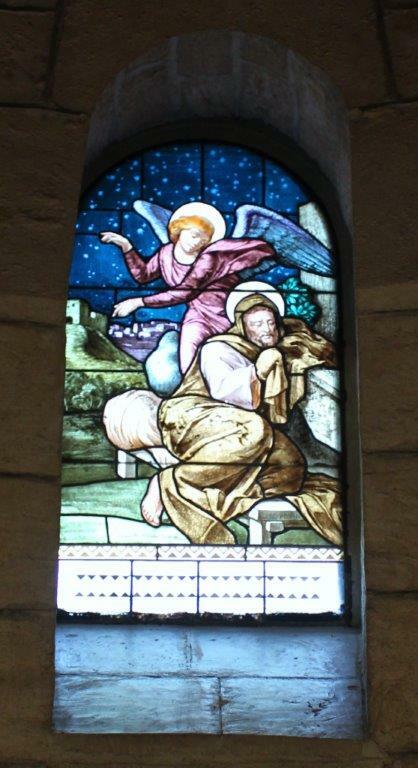 Stained glass depiction of Joseph’s encounter with God’s angel. The Church of St. Joseph, Nazareth, Israel. 2014. “I’ve got pageant on the brain.” It’s a temporary affliction that I most recently revealed to my friends one evening while we were playing Euchre. The conversation had been swimming around careers and responsibilities, and at some point I squeezed in my earth-shattering news: I’m directing the Christmas pageant at my church and am preoccupied with the planning. Two years ago, I took on the endeavor for my first time. When I told one of my best friends, she surprised me by laughing. So much for the vote of confidence, I thought. Then, I realized that she grew up with me and she remembered what I was like as an adolescent. Back then, I hated speaking in public, was never in a play, and quit going to church sometime during high school. Upon reflection, her reaction seemed somewhat appropriate, except a lot had happened since our childhood. Little by little, God had prodded me until my faith had grown strong enough that I could be trusted with telling His story. I knew organizing the pageant would be a huge responsibility. Parents wanted to see their children participate in an appropriate demonstration that would honor Jesus. Children expected to have fun while being part of an important presentation. And God seemed to be nudging me to deliver the pageant in a way that would help others appreciate the unique circumstances surrounding His Son’s birth. Did I understand the historical event well enough to accurately portray Jesus’s entry into the world? Not entirely. But I have heard it said that if you really want to learn something, then you should teach it to someone else. Since I would be doing both, I felt obligated to look for reliable information. I consulted several different sources, sifted through books and articles, garnered what I needed, and wrote the script for The Story of Jesus’s Birth. The pageant was introduced to my congregation as the “Authentic Christmas” story because I hoped to do away with many common misconceptions and show people a more realistic rendition of the miraculous event that took place over 2000 years ago. I didn’t want to rewrite history, but I found many tidbits that warranted my tweaking of the traditional Christmas pageant. Here are some of the things I found interesting and the ideas that took shape. Jesus fulfilled more than three hundred prophecies, an astounding number considering they were written over four hundred years before He was born. His birth, life, and sacrificial death were foretold well before he walked the earth. His role as savior was long expected. Stone feeding trough. Photograph taken by Kelly Bixby in Megiddo, Israel. 2014. Joseph’s arrival back in his hometown of Bethlehem for the census may have been similar to our modern day experiences of going home for a holiday. Sometimes we have to sleep on the couch because Auntie Em is in the spare bedroom. It doesn’t mean we can’t stay; we just get whatever space is still left. The familiar misconception of a callous innkeeper may have evolved from nothing more than a tired and grumpy cousin who didn’t get to sleep in his own bed one special night. The place offered to Mary and Joseph could have been the only room of his house that wasn’t already overflowing with relatives and other guests. It would have been the lower portion of the resident’s home (a multi-level cave) where valued animals were routinely brought inside at night. There they were safely protected from loss and theft while the owners slept in an upper room. 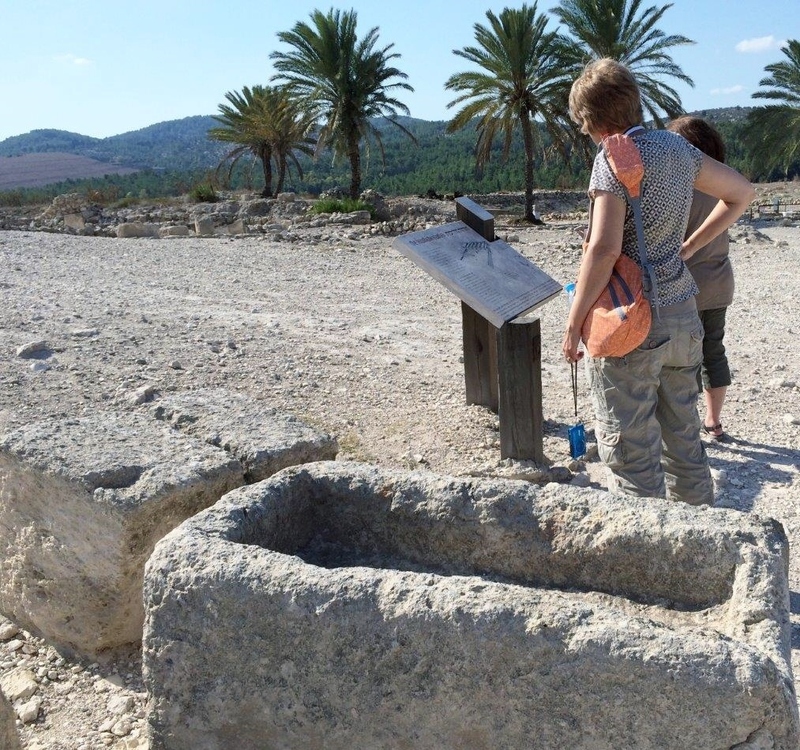 No one really knows if any animals were present and lying near the baby Jesus on the night of His arrival, but there is evidence that Jesus’s bed was a stone feeding trough, not a wooden manger, built into the lower room. Under normal circumstances in ancient Israel, Joseph wouldn’t have been in the room when Mary gave birth. He would have remained close by and quick to enter after Jesus was cleaned and swaddled. 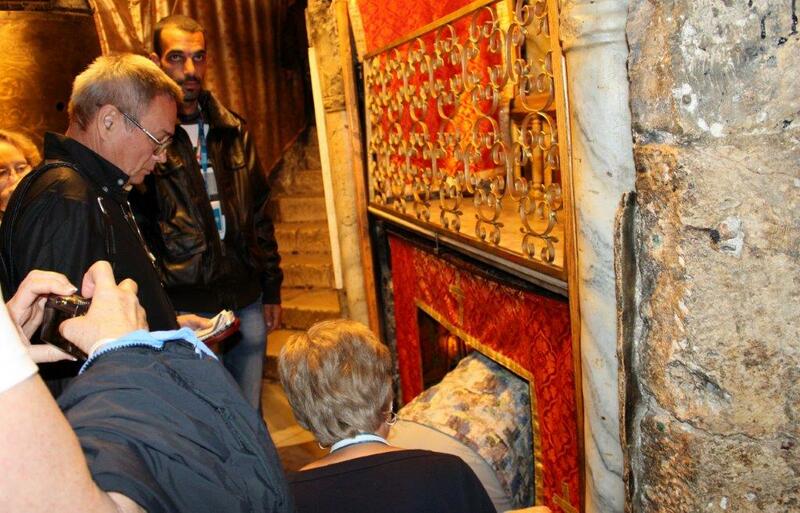 Below the ornamentation and decorative tapestries is the ground of a cave presumed to be the birthplace of Jesus. The Church of the Nativity, Bethlehem, Israel. 2014. Wise men, commonly referred to as Magi, came to worship Jesus, but not on the night of His birth. Their visit may have taken place as long as two years afterwards. So in our pageant, the unnamed Magi from the east humbly bowed before a toddler Jesus as He stood beside his mother in their home, not a stable. The visitors were most likely not kings, but they may have been astrologers or advisors to kings. There was more than one Magi, but the Bible doesn’t specify the exact number. Tradition, whether right or wrong, sets the number at three. Jesus was taken to safety in Egypt, thus spared from paranoid King Herod’s orders to massacre all the boys in Bethlehem who were two years old and younger. This tragedy is pretty well known, but it is often left out of Christmas pageants. One reason is that this tale is gruesome and unsettling. Even I glossed over sharing this part of history because the pageant was ending and I wanted a softer transition into a joyous closing hymn. I would have liked to have explained that more than baby boys would have been killed. In their fury, it’s presumed that Herod’s army didn’t take time to figure out which babies were boys and which were girls; and if parents tried to protect their children, they may have been killed too. Overall, our pageant looked fairly traditional. Youth portrayed every part. They became fluffy sheep, brilliant angels, and humble shepherds. As wise men, they looked like kings, complete with two-legged camels trailing behind. 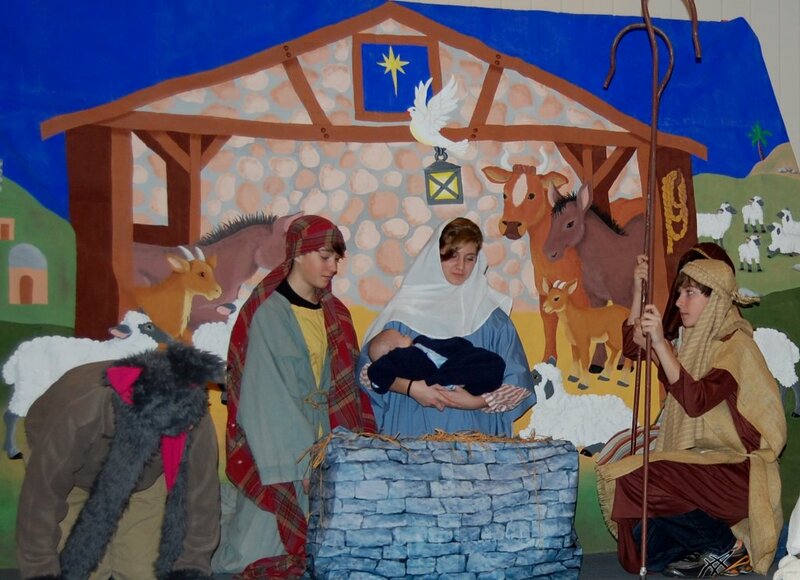 The highlight was still the scene with a costumed donkey that came to rest next to Mary, Joseph, and baby Jesus. Did anyone notice the non-traditional yet more realistic stone manger? Was anyone surprised to learn about Simeon and Anna? Or that Jesus was at least two years old when the Magi bowed before Him? I had achieved my goal of introducing lesser known details into our rendition of the Christmas story. I hoped that many were inspired to wonder what that night was really like. The pageant required long hours of planning and the support of a small army of family and friends. Together, we survived the crazy, energetic practices and embraced impromptus by our young actors. There were tears (mine) during group prayer and joy as I watched God’s precious children welcome and worship baby Jesus. The parents smiled. The children beamed. I was amazed by it all and felt like the one who had the most fun. Bart D. Ehrman, “The Myths of Jesus,” Newsweek 17 Dec. 2012: 26-28. Bert Gary, “Are Kids’ Christmas Plays Biblical?” downloaded Nov. 2012 <http://bertgary.blogspot.com/2009/01/are-kids-christmas-plays-biblical.html>. Daniel B. Wallace, “The Birth of Jesus Christ,” Bible.org downloaded 7 Nov. 2012 <https://bible.org/article/birth-jesus-christ>. The NIV Study Bible, ed. Kenneth Barker (Michigan: Zondervan Publishing House, 1995) 1436-1439, 1533-1538. Several people (including me) felt that that was the best Christmas pageant anyone could remember. I have never seen a Christmas pageant where the Holy Spirit was so obviously involved and inspiring! Beth, I’m most happy that you saw God’s presence in the pageant. I leaned on Him during the entire process, and He brought the right people to the project at exactly the right time. Thanks for your kind words, ongoing support and friendship. Sounds like a fascinating research experience and a different writing experience. How did you enjoy doing script writing? Was this your first time writing in that form? Hi Sue, I delved into script writing years ago when I adapted a vacation Bible school play to fit a specific need for my church. Having to piece together pre-existing content helped me get familiar with the proper layout and technique. Then, with each subsequent opportunity, I’ve tried to incorporate more of my voice and vision into the end result. I can’t take full credit yet for completing a script on my own, and so I carefully acknowledge the sources that I draw from. I’ve absolutely loved the experiences, in part because I’ve been able to see the plays performed immediately upon finishing the writing. Kelly, what a tremendous undertaking. Are you doing it again next year? The million dollar question…I have to tell you, Book Lover, that when my pastor said to the congregation that he would enjoy having a pageant every week, I just about fell out of my pew! Thank goodness he wasn’t serious. Let’s just take it a year at a time.